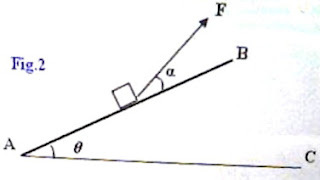 (a) Initially the frictional force Ff between the inclined plane and the block is sufficient to keep the block at rest. The coefficient of static friction between the incline and the block is μ. On the dot below (Fig.3) that represents the block, draw and label a free body diagram for the block in this situation. (c) A force is now applied on the block in a direction making an angle α (Fig.2) with the inclined plane so that the block just moves up the plane. 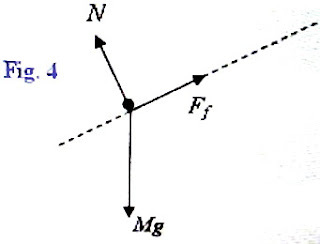 (a) The free body diagram is shown in Fig.4 in which Mg is the weight of the block, N is the normal force exerted on the block (by the inclined plane) and Ff is the frictional force on the block. The frictional force prevents the block from sliding down. (b) The forces acting on the block are shown in the adjoining figure (Fig.5). The component (Mgsinθ) of the weight of the body, parallel to the incline is the force trying to move the body down the plane. The normal force N is the reaction (force) opposing the component Mgcosθ of the weight of the body normal to the inclined plane. The frictional force Ff is opposite to the component Mg sinθ parallel to the plane. Since the block is at rest, the net force acting on it is zero and Ff is just sufficient to balance the component Mg sinθ (of the weight of the body). Thus the magnitude of the frictional force on the block in this situation is Mg sinθ. The frictional force opposing the motion of the block upwards is μN = μ(Mgcosθ – F sinα). When the block just begins to move up the incline, the net force acting on it is zero. 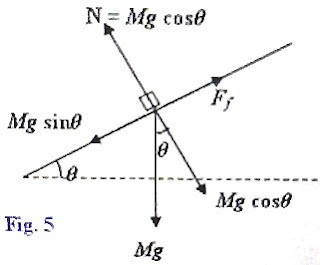 The force component trying to pull the block up the incline is Fcosα and the forces trying to oppose the motion are the weight component Mgsinθ and the frictional force = μ(Mgcosθ – F sinα). The pulling force will be minimum when the denominator cos(α – λ) is maximum, equal to 1. [Note that cos(α – λ) = 1 when α = λ. So the inclination of the pulling force with the inclined plane must be equal to the angle of friction]. (d) Since the block is moving down with uniform velocity, the net force acting on the block is zero. In this situation the frictional force is μMgcosθ and it acts up the plane, opposing the downward motion of the block. The component of the weight Mgsinθ of the body acts down the plane and tries to drive the body down the plane. These are thus equal in magnitude and opposite in direction. [The velocity 0.2 ms–1 mentioned in the question should not distract you. It does not affect the answer as long as it is uniform. If its magnitude is smaller than the given value, it just means that the initial push given to the block was softer]. Ff = Mgsinθ = 2×10× sin 30º = 10 newton.